There will be a free ‘Back to School Gathering’ on Thursday, September 6th from 5.30pm to 7.00pm at the Bermuda College Student Hall. 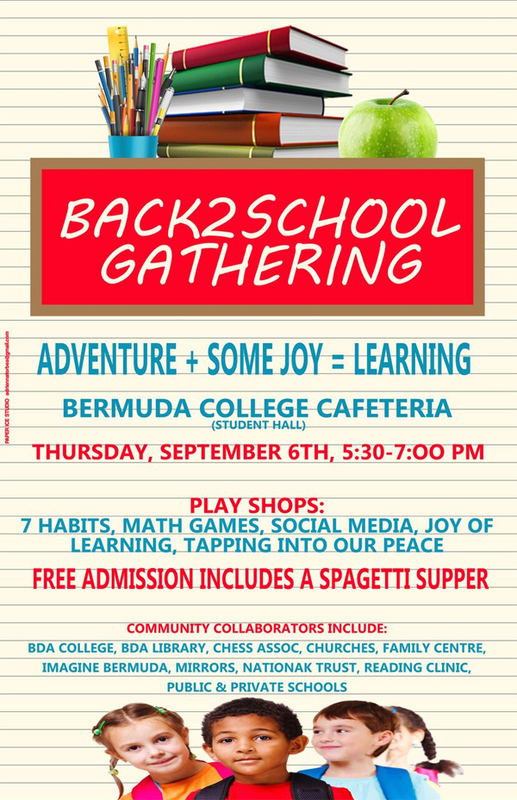 Glenn Fubler from Imagine Bermuda said, “As families with school-age young people, engage in preparation for the start a new school year, a collaboration of stakeholder organizations has pulled together a free event at the Bermuda College Student Hall on Thursday, September 6th from 5.30 – 7 pm. “The goal of this Gathering is to assist in the empowerment of families in their role of leveraging the potential of all our Island’s students. “There is not only free admission for the event, but it also includes a free Spaghetti Supper. This is made possible through members of a number of churches, neighbouring the Stonington campus, rallying to this cause. A reminder of the best spirit of Bermuda. “The Gathering has been designed, recognizing that learning occurs when it involves an adventure and some joy. Therefore, the optional ‘playshops’ will be interactive; no longer than 30 minute-duration. ‘Finding that Math can be fun’ – by the Bermuda Council of the Teachers of Math – which includes public & private schools, as well as the Bda College. “There will also be a round-table session led by educators from the public & private sector on ‘ How Families can Negotiate a Balance for all concerned’. Vote no more: Well done govt. Let's hear the spin on this, probably OBA fault. D: "FinTech" aka "Financial Technology". It's a broad topic which includes ATMs. wahoo: Once the rats jump off we can re-float her and she will sail on.